The construction of the church was commissioned in 1572 by Grand Master Jean de la Cassière to serve as the conventual church of the Knights of Malta. 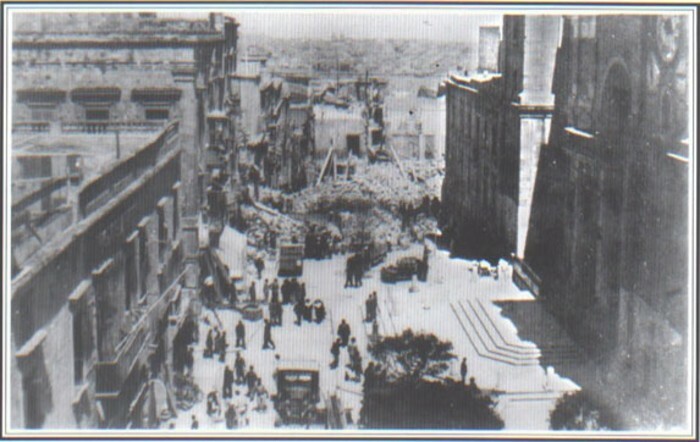 It was designed by the Maltese military architect Gerolamo Cassar. The church was dedicated to St John the Baptist, the patron saint of the Order. 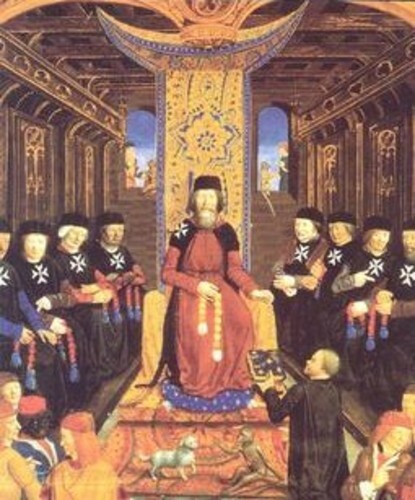 After defending Malta from the Ottoman attack in the Great Siege of 1565, the Knights built a new fortified capital city that befitted a noble military Order. Pride of place in the centre of the new city ‘Valletta’ was reserved for their Church. 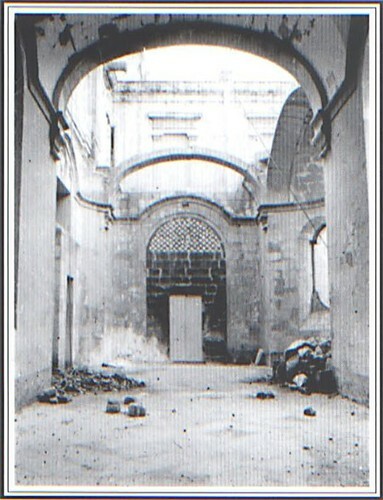 The construction was completed in 1577. The nave is fifty-two metres in length and fifteen metres wide with side chapels on either side. At a later stage the side chapels were assigned to the various langues according to seniority. The plain façade flanked by two large bell towers is austere and has the character of a fortress reflecting the sober mood of the Order after the Great Siege. The grand scale of the church also reflected the context arising after the Council of Trent to express the triumph of Catholicism. The church would serve as the Knights’ religious headquarters and to show case their artistic patronage and the power of the Order. The dawn of the seventeenth century ushered in the new Baroque style, as a consequence of the Catholic Reformation. Several churches across Europe were being built or embellished with the new artistic language. The Knights were eager to have a church that could rival the great churches of Rome and the era’s flamboyant and demonstrative character provided ample material. Grand Masters and knights donated gifts of high artistic value and made enormous contributions to enrich it with only the best works of art by leading artists available to them. The Calabrian artist Mattia Preti, who was commissioned the decoration of the vault, transformed the interior into a celebration of Baroque art. It is the contrast between the austere architecture of the façade and the richness of the interior that renders St John’s church a unique monument. The eighteenth-century English traveller to Malta, Patrick Brydone, recorded in a 1773 letter describing ‘A Tour through Sicily and Malta in a series of letters to William Beckford, Esq. of Somerly in Suffolk’ that “St. John’s is a magnificent church. The pavement is reckoned the richest in the world. It is entirely composed of sepulchral monuments of the finest marbles, porphyry, lapis lazuli, and a variety of other valuable stones admirably joined together, and at an incredible expense; representing in a kind of Mosaic, the arms, insignia, &c. of the persons whose names they are intended to commemorate. In the magnificence of these monuments, the heirs of the grand masters, and commanders have long vied with each other. We went this day to see the celebration of their church service. It seems to be more overcharged with parade and ceremony than what I have ever observed even in any other Catholic country. After the Knight’s expulsion from the island by Napoleon troops in 1798, the church ceased to function as the Knights’ conventual church. 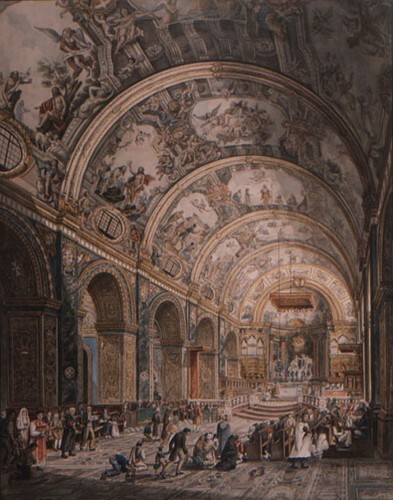 Napoleon Bonaparte decreed that the church was to serve and function as the co-cathedral for the Bishop of Malta who assumed spiritual responsibilities over St John’s Church. Following the surrender of the French to the British in Malta in September 1800 and the British Government’s resolution upheld all the previous rights over the island’s possessions. The Cathedral Chapter continued to officiate within the church, seeking protection from the Papacy to secure the cathedral status that it had been granted. 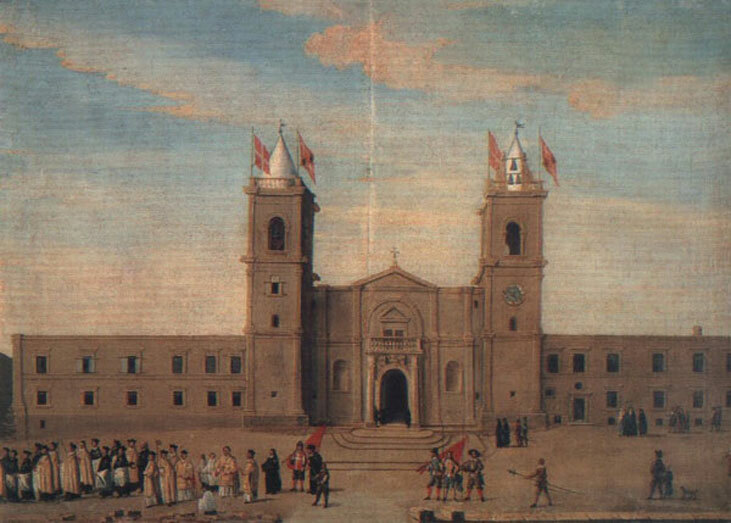 Following a new petition by Bishop Ferdinand Mattei, a decree was issued by Pope Pius VII on 27 January 1816 that confirmed the election of the church to Co-Cathedral. The Independence of Malta from Britain followed in 1964. St John’s church is administered by the St John’s Co-Cathedral Foundation responsible for the religious cultural heritage of the monument. Today, it is a venue for cultural events and is one of the most popular cultural attractions in Malta visited by tourists.